A number of the Caxton team members are also often out on location for photoshoots or at client meetings, and in these cases a fast Internet connection is needed to help with searching the web for inspiration, stock photography, demoing artwork or simply to enable the freedom that those in a creative industry require. Some employees have almost no branch that they call home; constantly on the move from one location to the next, completing audits, giving training or presenting financials on the go. As Derek explains, “Coffee shops, airport lounges and randomly located Wi-Fi hotspots are great, but each of these come with their own limitations in terms of speed and data limits, often restricting how well work can be done in the limited time between flights, meetings, etc. As with most South African businesses, Caxton is facing the additional challenge of load shedding. “With load shedding becoming a part of everyday life, we have had to get creative about how we keep our operation running, especially when electricity is down for hours on end at a time”, says Derek. Caxton was therefore looking for a solution to the various problems outlined above while being able to supply their business divisions with fast, reliable Internet without the addition of hours spent on extra resource management and infrastructure. This is where RSAWEB was able to help. Having access to fast mobile data with a reliable connection and without harsh restrictions ultimately enables Caxton’s staff to get the job done faster and more simply. Additionally, thanks to RSAWEB Mobile Data and fully charged laptops, work doesn’t have to come to a grinding halt every time Eskom flips the switch and cuts the electricity. The average laptop has 5 hours or so of battery life while the mobile devices can last 15+ hours with continuous use. This is enough to outlast even the longest load shedding sessions which tend to last between 2-4 hours in most areas. 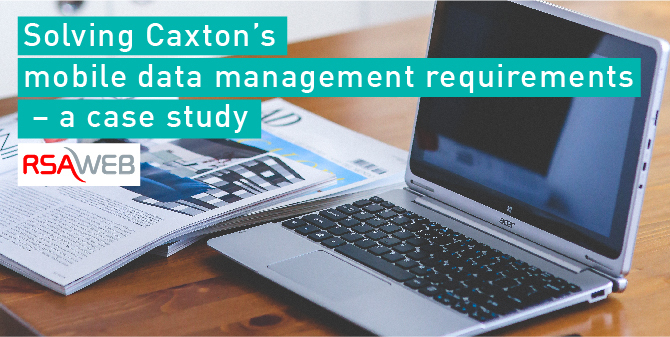 After carefully assessing Caxton’s needs, RSAWEB implemented the following solution: providing 40 different business groups with a total of 550 SIM cards, 434 unique user accounts and a 350GB connection up to 21,6Mbps with a total of 1.5TBs of data allocated. All of this was set up with a simple and easy to use management system, enabling Derek to manage the 450+ SIM card connections across the business himself. RSAWEB’s online control panel allows one to increase monthly data quickly and easily and you are also able to pool data, ensuring that no one in the business suddenly goes offline if they exceed the committed monthly data cap. “We over-allocate quite a bit; four times more than our monthly data bundle, but the average across all divisions remains quite consistent and we don’t see any sudden jumps in usage. Some employees use every MB and get capped each month while others connect once or twice with little usage. We have users with monthly data caps of as little as 1GB per month and others with as much as 15GBs” added Derek. As a result of implementing RSAWEB’s mobile connectivity solution, Caxton has enabled their employees to continue working remotely while on location at a shoot or while travelling for work, ensuring the company remains ahead of their competitors in terms of news reporting and response times. The business rapport within the market increases and they have been able to establish themselves as industry leaders, all while easily managing the usage of over 466 SIM cards in various locations across the country. Here is an another interesting article on How to manage mobile data more effectively.